External and Internal factors effect the online presence of a brand; this interaction is the Ying and Yang of social media analytics. Both are needed to for successful analysis of a brand, and subsequently any online campaigns the company runs. External factors include tracking consumer’s interaction with the brand online. Many times, businesses focus on the campaign they are running, and not the social media conversation surrounding their brand on a day-to-day basis. An example of this is the interaction between a clothing brand and an unsatisfied customer. I have blanked out the names of the people involved and the brand for privacy reasons, but the message is still the same. 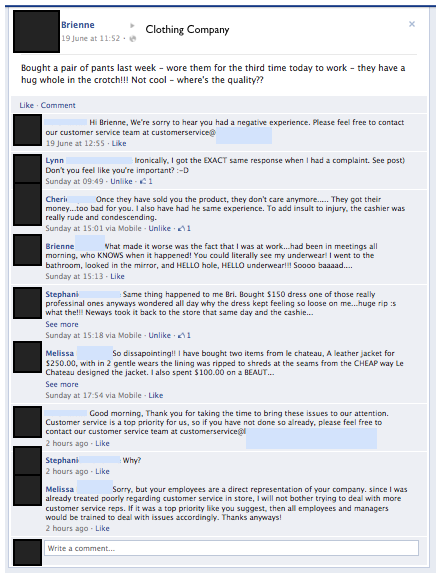 The customer was unsatisfied with the quality of the product, and said so on the brand’s Facebook wall. The brand contacted the customer publically on the wall, asking them to email their customer service department. Other customers picked up the story and proceeded to share their less than positive experience with the brand. To-date, the brand has not addressed the concerns of the other customers, nor sufficiently attended to the original post. In this situation, the brand should have contacted the initial customer privately, and offered a gift card, or something to show they cared, then mentioned publically that the issue had been resolved. Instead, the brand has to-date, only offered a customer service email and phone number. The Internet is a global space, and with that, geographical state lines are disappearing. People across nation states are able to connect with others. This global community is daunting for brands. For the first time in history, word-of-mouth has a global platform, and brands are unable to control the conversation about them. Companies need to assess external factors that affect the success of their brand online (the Ying), as well as the internal data collected through a specific campaign (the Yang). The key to a strong social analytics approach is to connect intelligence from external and internal sources. A strong campaign needs to run for at least two months – or have a 12-month plan, with campaigns every three months (four per year). The key to a strong campaign is to determine the best platform to run the campaign – Facebook, Twitter, LinkedIn, or a mixture of all three? One must also measure what works and what doesn’t. MavenSocial’s real-time analytics allows users to see which marketing channels are working the most effectively. Results of a traditional marketing campaign take months to analyze, and results are not available until after the campaign finishes. With MavenSocial analytics, in real-time, users are able to see which marketing channels are working the best, and re-align marketing funds based off of the immediate campaign results aggregated by MavenSocial. When managing a brand’s online presence, it is important to align the Ying and Yang of social media analytics. Without a strategy that plans for both internal and external, a digital marketing strategy will fall flat. Maven Social is on Facebook! Find us at: http://www.mavensocial.com/ Maven Social tracks conversions through our Social Analytics, helping you identify your social media influencers, and increase social lift.